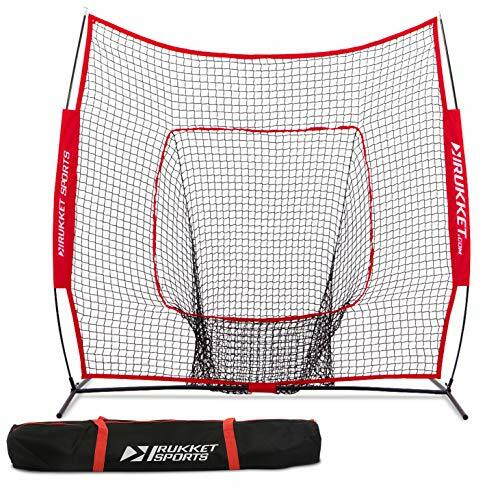 Rukket Sports 7 x 7 Baseball & Softball Practice Net with Bow Frame (Lifetime Warranty) Rukket Sports: Leader in Baseball and Softball Training Gear Rukket Sports' baseball and softball hitting nets and training products outscore their opponents 1 Million to Zero! Join the winning team and get your team on the way to winning or continue those winning ways with Rukket! 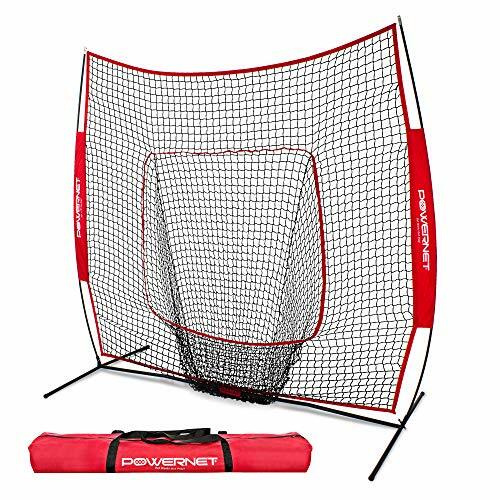 Cutting-Edge and Saves You Money and Time This innovative and affordable 7x7 baseball net is a durable and portable baseball and softball training net perfect for tee-ball practice, in-field practice, soft-toss, and softball and baseball pitching practice. The uniquely designed bow frame allows the slight bend of the poles to give more flex and the result is a sturdy structural net that will take on all levels of pitching, throwing, and hitting stress. Competitors Nets are Inferior Quality Typical baseball and softball nets are bulky, heavy to move and potentially unsafe. Not to mention most field facilities are limited, forcing coaches to share and split time with other teams. Other nets available for purchase on the market carry a pretty hefty price tag, are made of inferior material, and can still be a burden when it comes to maneuverability and ease of use. Lifetime Warranty: We follow through on our promise to offer the best customer service to you! LIFETIME WARRANTY: Purchase with full confidence knowing that should you find anything defective for the life of the product, we will ship replacement parts free of cost promptly. We stand behind our commitment to delivering the best quality with the best value and follow it up with the best customer service. Need help or have a question? Contact us anytime and we are easily reachable right on our own website too via 'Contact Us'! We respond to our customers quickly and courteously from US customer service representatives. PROVEN DURABILITY: 2X double thick netting, heavy & sturdy frame. Increased thickness adds rigidity and weight for greater stability when batting into the net. STOP CHASING BALLS AROUND THE YARD: Our unique fold-up design makes the net easy to set up so you can start practicing within minutes, and waste less time chasing balls. PERFECT FOR BATTING and PITCHING SKILL DEVELOPMENT: Our super strong 7-ply knotless netting and increased frame thickness adds rigidity and weight for greater stability when batting and pitching into the net. FOLDS DOWN and EASY TO TRANSPORT: The sturdy and stable yet lightweight net and frame collapse into the included carrying bag for easy transport and storage. 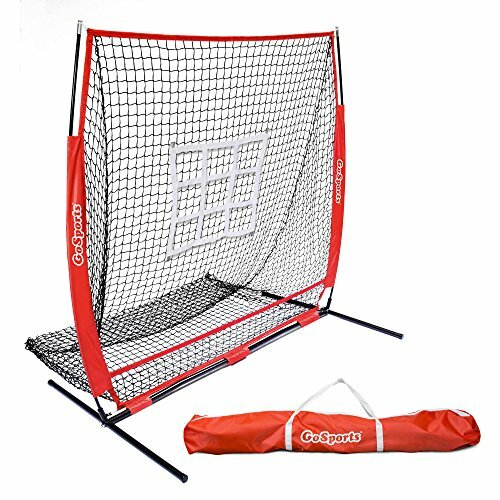 The GoSports 5' x 5' sports net is a must have for any Baseball or Softball player. The net is designed to help players train in several key areas: Pitching: Each net includes an adjustable strike zone that attaches to the net so pitchers can dial in their various pitches without needing a catcher. Fielding: Setup the net behind a base and practice fielding balls and throwing accurately into the center of the net. The net sets up in minutes so it can easily be taken to fields for training, but it can also be used in your backyard. The net is made using a powder coated steel frame with a robust polyester net to withstand years of use. It is also backed by a GoSports lifetime warranty so you can buy with confidence. This is a must have for any Baseball or Softball player looking to take their game to the next level. 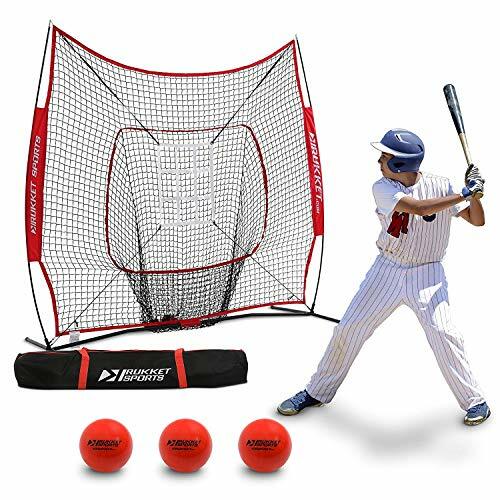 ULTIMATE TRAINING AID: Perfect for players of all abilities for batting practice, pitching, fielding, catching, and backstop use - spend less time chasing balls and more time honing skills! Rukket Sports Baseball Hitting Net and Softball Hitting Net PRO BUNDLE Includes the Original Sock It! 7x7 baseball and softball sock-style bow frame net, THREE PurePower Weighted Training Balls, FREE Strike Zone Target. Rukket 7x7 Baseball Practice Net This innovative and affordable 7x7 baseball net is a durable and portable baseball and softball training net perfect for tee-ball practice, in-field practice, soft-toss, and softball and baseball pitching practice. The uniquely designed bow frame allows the slight bend of the poles to give more flex and the result is a sturdy structural net that will take on all levels of pitching, throwing, and hitting stress. Typical baseball and softball nets are bulky, heavy to move and potentially unsafe and most field facilities are limited, forcing coaches to share and split time with other teams. Other nets available for purchase on the market carry a pretty hefty price tag, are made of inferior material, and can still be a burden when it comes to maneuverability and ease of use. Rukket PurePower Weighted Training Baseballs & Softballs for Hitting and Pitching (3 Pack - 1lb /16oz. 3" diameter) Our weighted training ball allows you to truly "feel" the bat as you drive the barrel thru the ball. Our weighted ball is 1lb (16oz. ), 3" in diameter, ridiculously rugged and made from the most durable materials available. The best part of our heavy practice ball is INSTANT feedback. You'll develop not only a powerful swing, but the perfect swing. Each ball is designed so that if it's not hit pure, it will just wobble and fall. You'll instantly know with every swing if your "right" or not allowing you and your coach to make necessary adjustments quickly. 6pc BUNDLE: Original Rukket Sock It! 7x7 baseball/softball sock-style bow frame net, three PurePower weighted training balls, strike zone target, and carry bag. 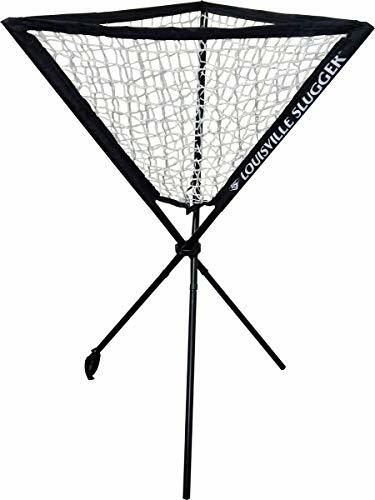 The Louisville Slugger Ball Caddy is the perfect training item for any coach, player, or team. The simple foldable design and included carry bag allow you to take the caddy anywhere you train. This is the perfect accessory for any baseball or softball training program or practice. Sets up in just seconds and is tall enough so you don't have to bend over to get a ball. Much better than a ball bucket! Includes carry bag for easy transport. Every baseball or softball coach or hitting trainer should have one.